PURPOSE: The purpose of this study is to compare the success rates of endoscopic endonasal dacryocystorhinostomy (EN-DCR) and external DCR (EX-DCR) for the treatment of primary acquired nasolacrimal duct obstruction (PANLDO). DESIGN: This was a retrospective, comparative, nonrandomized clinical study. METHODS: Reviewed medical records of PANLDO underwent DCR at Far-Eastern Memorial Hospital from May 2011 to June 2017. Data regarding the lacrimal passage system, comorbidities, surgical outcomes, and postoperative complications were analyzed. Anatomical success was defined as patency confirmed by intranasal endoscopic inspection of the ostium and successful lacrimal irrigation; functional success was defined as complete resolution of epiphora and positive fluorescein dye disappearance test, which were assessed at postoperative 6th months. RESULTS: One hundred and seventy patients (37 males, 133 females, mean age 57 years) underwent 178 DCR surgeries for PANLDO. The overall anatomical success rate was 94.4% (93.5% in EN-DCR vs. 95.8% in EX-DCR, P = 0.511) and functional success rate was 90.4% (90.7% in EN-DCR and 90.1% in EX-DCR, P = 0.909). Surgical outcomes were comparable between two groups. Complication rate was low in both groups, including 11 cases of early canalicular stent dislodge (7 in EN-DCR, 4 in EX-DCR), one case of postoperative nasal bleeding in EN-DCR, and two skin wound dehiscence and three cutaneous keloid formation in EX-DCR. None of these cases were concluded into surgical failure at the final visit. The time to symptoms relief was statistical significantly shorter in EN-DCR group (1.7 vs. 3.7 weeks in EX-DCR, P < 0.001). CONCLUSIONS: Success rate of DCR for PANLDO in our study was high, and complication rate was low for both endoscopic and external approaches. There was no statistically significant difference between them. EN-DCR provided higher satisfaction due to quicker recovery and lack of external incision. Endoscopic DCR should be considered as the primary treatment of choice for PANLDO. Dacryocystorhinostomy (DCR) is the standard procedure for the treatment of primary acquired nasolacrimal duct obstruction (PANLDO). The principle of the surgery is to create an anastomosis between the lacrimal sac and nasal cavity by removing the bone that separates these two structures and bypass the occluded nasolacrimal duct of the downstream. The advantages of EX-DCR include direct visualization of the lacrimal sac for identification of the sac pathology, no need for expensive instruments, the allowance of secure flaps creation, and sutures to form a fine anastomosis between lacrimal sac and nasal mucosa, which is one of the key factors to surgical success. The disadvantages of EX-DCR are related to the skin incision that may cause scar formation  and interference of the lacrimal pumping function due to disruption of medial canthal tendon, orbicularis muscle, or superficial branch of facial nerve. On the opposite, EN DCR has benefits of preserving lacrimal pumping function without eyelid anatomy disruption, no risk of external scar, and the ability of concurrently address intranasal pathology in one surgery. The drawbacks of the EN-DCR include high cost of the instrument, steep learning curve of the endoscope technique for ophthalmologist, and difficulty of lacrimal sac-nasal mucosal flaps suturing and manipulation. Debate continues regarding EX-DCR versus EN-DCR. The reported success rate of both procedures varied in the literature, ranging from 60% to 99%.,,,, The purpose of this study is to compare the surgical outcomes of EX-DCR and EN-DCR for the treatment of PANLDO in our hospital for the past 6 years and to share the personal experience of transition from EX-DCR to EN-DCR as an ophthalmologist. This is a retrospective, nonrandomized, comparative study conducted at Ophthalmology Department of Far-Eastern Memorial Hospital, New Taipei City, Taiwan. Medical records of all patients who underwent surgery for PANLDO from May 2011 to June 2017 were reviewed. The diagnosis of PANLDO was based on the presence of symptoms with epiphora, clinical observation of fluorescein dye disappearance test and documented obstruction by lacrimal irrigation and probing. Exclusion criteria included previous DCR surgery, canalicular obstruction, congenital NLDO, previous trauma history of lacrimal passage system, previous irradiation therapy covering nasal or periorbital region. All patients were well informed about the advantages and disadvantages of the EX-DCR and EN-DCR methods; however, the types of the surgical approach were decided according to the surgeon's judgment. All surgeries were done by single surgeon (Pei-Yuan Su, M. D.) under general anesthesia. About 1% lidocaine with 1:100,000 epinephrine was used for local infiltration of incision site of skin and nasal mucosa. Nasal packing with cotton sponges soaked with mixture of 4% lidocaine and 1:100,000 epinephrine were inserted for intranasal vasoconstriction 20 min before the surgery. For EX-DCR, a 15–20 mm curved skin incision was made medially to the angular vein at the level of the anterior lacrimal crest. The orbicularis muscle was then blunt dissected deep down to the periosteum, and the lacrimal sac was exposed by partial incision of the medial canthal ligament. The periosteum was opened by surgical blade and lifted from the anterior lacrimal crest by the freer elevator. The periosteum along with the lacrimal sac was displaced laterally. A squared bony window, sized 15 mm × 15 mm in diameters, was created with the help of drill between the insertion of the medial canthal tendon superiorly and the proximal nasolacrimal duct inferiorly, extending from anterior to posterior lacrimal crest. The lacrimal sac and nasal mucosa were opened with surgical blade in the shape of letter H, and the opposing mucosa flaps were sutured with interrupted 5-0 Vicryl. A Crawford bicanalicular silicone stent was inserted and tied in the nasal cavity. The skin was closed with interrupted 6-0 nylon sutures. For EN-DCR, the surgery was performed with zero-degree Karl Storz endoscope. A light pipe used in retinal surgery was inserted from the upper punctum to localize the lacrimal sac. A crescent knife was used to make a vertical mucosal incision, starting 10–12 mm anterior to the axilla of the middle turbinate along the maxillary line, and extend 15–20 mm inferiorly toward the insertion of inferior turbinate. Freer elevator was used to raise the nasal mucosal flap and dissected posteriorly over frontal process of maxilla to its junction with the lacrimal bone. The nasal mucosal flap was removed by Blakesley nasal forceps. A bony window, sized 12 mm × 15 mm in diameters, was created by Kerrison rongeur and sometimes with the help of chisel and hammer. After fully exposed of the lacrimal sac, a vertical incision with horizontal releasing incisions at both superior and inferior end was made to cut the sac open. Fluorescein dye water irrigation from upper and lower punctums was performed to check flow patency. The Crawford bicanalicular (FCI ophthalmic, France) stent was inserted and tied in the nasal cavity. A 10 mm × 10 mm sized kenacort-soaked SPONGOSTAN™ (absorbable hemostatic gelatin sponge, Ferrosan Medical Devices A/S, Denmark) was packed onto the lacrimal sac, which helped the sac flaps to roll out against the lateral nasal wall and allowed better approximation of sac mucosa to the nasal mucosa edges. Nasopore ® fragmentable nasal dressing (Polyganics BV, Groningen, Netherlands) was inserted to the nasal cavity at the end of the surgery. During the postoperative period, all patients were prescribed eye drops with 4% sulfamethoxazole and 0.1% fluorometholone four times a day for 1 month. The skin sutures of the patients with EX-DCR were removed 1-week postoperatively. The silicone tube was removed 6 months postoperatively. All patients were assessed at the postoperative 1st week, 1st month, 3rd month, and 6th month. During the follow-up visit, patients were asked about the symptom relief of epiphora and check patency by fluorescein dye disappearance test, lacrimal irrigation, and intranasal endoscopic examination. Primary outcome measurements were the anatomical and functional success at the final visit. Anatomical success was defined as patency confirmed by intranasal endoscopic inspection of the ostium and successful lacrimal irrigation. Functional success was defined as complete resolution of epiphora and positive fluorescein dye disappearance test. Secondary outcome measurements were the postoperative time to the resolution of epiphora and surgical-related complications. All patients were followed up for at least 6 months. Data were analyzed using SPSS software Version 21.0 (SPSS Inc., Chicago, USA). Continuous variables were presented as mean ± standard deviation. Categorical variables were presented as numbers and percentages. The significance of the difference among groups in terms of means was analyzed by Student's t-test, and categorical variables were analyzed by Chi-square test. P < 0.05 was considered statistically significant. This study was approved by the institutional review board (IRB) of the Ophthalmology Department, Far-Eastern Memorial Hospital, and conducted in accordance with the tenets of the declaration of Helsinki. After exclusion, those with incomplete data collected, a total of 170 patients (37 male, 133 female) underwent 178 DCR surgeries (8 bilateral sequentially) for PANLDO were included in this study, with a mean age of 57 years. Demographic data of the study population were summarized in [Table 1]. Comparing EN-DCR to EX-DCR groups of patients, the age was older, and there were more cases with diabetes in EX-DCR group. Besides, there was no statistically significant difference in gender, laterality, previous sinus disease or surgery, previous lacrimal procedure other than DCR, duration of symptoms before the surgery, and presence of acute or chronic dacryocystitis between two groups. Anatomical success was achieved in 100 (93.5%) of 107 cases for EN-DCR and 68 (95.8%) of 71 cases for EX-DCR. Functional success was achieved in 97 (90.7%) of 107 cases for EN-DCR and 64 (90.1%) of 71 cases for EX-DCR. There was no statistically significant difference regarding either anatomical or functional success rate between these two groups (P = 0.511, 0.909, respectively). The time for symptoms relief after the surgery was shorter in EN-DCR (mean time of 1.7 weeks) than in EX-DCR group (mean time of 3.7 weeks) (P < 0.01). The comparison of surgical outcomes was summarized in [Table 2]. Of the seven failure cases in EX-DCR group, no one had received surgical revision. Of the 10 failure cases in EN-DCR group, five cases (50%) underwent endoscopic revision and functional success was achieved in three cases (60%). During the postoperative follow-up period, early canalicular stent dislodge was noted in seven cases in EN-DCR group and four cases in EX-DCR group. One case in EN-DCR group experienced massive nose bleeding after removal of nasal packing 1-week postoperatively and stopped bleeding soon after Nasopore packing. None of the patients mentioned above were concluded into failure surgical outcome. Complications associated with surgical skin incision were noted in five cases of EX-DCR group; two with partial wound dehiscence which were treated by suture repair, and three with keloid formation which were improved after Kenacort injection. In our study, the overall success rate of DCR for PANLDO was 90.4%, which was similar to previous reports in the literature. There was no significant difference in terms of anatomical or functional success rate between EN-DCR (90.7%) and EX-DCR (90.1%). The reported success rate of EN-DCR in the literature ranges from 60% to 99%,,,, and EX-DCR from 80% to 95%.,,, Recently, Huang et al. conducted a systemic review and meta-analysis, including four randomized controlled trials and 15 cohort studies, for comparison of two approaches. The results showed comparable success rates between mechanical EN-DCR and EX-DCR (87%), while laser-assisted EN-DCR had poorer outcomes (77%) compare to EX-DCR. Our study revealed similar success rate to the previous reports. Studies for comparison of surgical outcomes of two approaches had been conducted and the results varied in the literature. There is still no consensus that which procedure is superior to the other. Lacking of standardized outcome measurements, variable surgical techniques, nonrandomized case selection, experience of the surgeon may all contribute to the variable reported outcomes. In our study, the success rates were assessed not only the symptoms relief from the subjective aspect of patients but also fluorescein dye disappearance test and lacrimal irrigation from the objective view of the physician. However, there was still bias in personal interpretation of both sides and that was the weak point of this study. The decision of surgical approach, through either external or endoscopic routs, for DCR often reflects the surgeon's training background. Ophthalmologist is familiar with the surgical incision through medial canthal area, while otorhinolaryngologist favors the transnasal endoscopic view to approach the lacrimal sac. With the increasing collaboration between these specialties, the practice pattern changes. In a survey among the American Society of Ophthalmic Plastic and Reconstructive Surgery members, 93.9% of 214 respondents offer EX-DCR whereas 63.1% offer EN-DCR. Kwok et al. studied the practice pattern on EN-DCR among oculoplastic surgeons in the Asia-Pacific region and reported that 28.9% of the 163 respondents offer only EN-DCR, 20.8% only EX-DCR and 50.3% offer both procedures. For oculoplastic surgeons in Taiwan, providing EN-DCR is still a minority but with a trend of increasing popularity. From my 10-year personal experience, surgical approaches gradually transited from only EX-DCR for the first few years to mainly EN-DCR (97.8%) in recent years. The key point of the changing was due to increasing capability of utilizing endoscopy, and it took about 3 years to meet the intersection point [Figure 1]. Besides surgeons' preference, patients' choice is actually the major concern for determinant of surgical approach of DCR. A study by Gauba V comparing EN-DCR to EX-DCR suggested that both procedures have high success rate and equivalent low risk of complications. However, absence of skin scar and quicker recovery time led to significant higher patient satisfaction for those who underwent EN-DCR. Although surgical success was comparable between two groups at final visit in our study, time to relief of symptoms after the surgery was statistical significantly shorter in EN-DCR compare to EX-DCR (1.7 vs. 3.7 weeks). We also observed few cases with transient lagophthalmos, which mostly resolved in 1-month postoperatively, that resulted in prolonged tearing despite anatomical patency in EX-DCR. That might result from disruption of medial canthal tendon along with orbicularis muscle and superficial branches of facial nerve that interfered the lacrimal pumping function by external skin incision. Few but still cases (7%) of EX-DCR in our study revealed skin wound complications of all degree. Although the mean age was older and the prevalence of diabetic was higher among patients underwent EX-DCR, we did not find correlations of these factors to the delayed time of symptom relief in EX-DCR compare to EN-DCR group. However, further randomized, controlled study is needed to clarify the association between them. With the convincing data that supported in our study, we believe it is worthwhile to shift EX-DCR to EN-DCR for patients' own good. Seventeen out of 178 cases (9.6%) in our study were consider surgical failure for those with symptoms of persisted tearing at final visit. Intranasal endoscopic findings of these patients included cicatricial closure of the ostium, adhesion of the nasal mucosa involving the middle turbinate or nasal septum, granulation tissue obscured the ostium, or membrane obstructing common canalicular opening. In a review of 100 revision DCRs performed in India, Dave et al. found most common causes of surgical failure included inadequate osteotomy, inappropriate sac marsupialization, and cicatricial closure. Lin GC reported the causes of failure DCR of 53 consecutive patients underwent EN-DCR revision surgeries and found 9.5% vs. 9.4% sump syndrome in EX-DCR and EN-DCR, respectively. Sump syndrome was noted in one of the revision cases in our study. This might explain those who revealed functional failure despite anatomical patency. Here, we would like to emphasize the importance of intranasal endoscopic examination during follow-up period since it is helpful for understanding the wound healing process and improving surgical outcomes. Both EX-DCR and mechanical EN-DCR surgeries for the treatment of PANLDO in our study revealed high success rate and low risk of complications. However, patients underwent EN-DCR had shorter recovery time and higher satisfaction due to lack of external incision, although final surgical outcomes were comparable between two groups. Ophthalmologists should definitely find ourselves a role in endoscopic lacrimal surgery and consider EN-DCR as primary treatment of choice for PANLDO. Toti A. Nuovo metodo conservatore di cura radicale delle suppurazioni croniche del sacco lacrimale (dacriocistorinostomia). Clin Mod Firenze1904;10:385-7. Dupuy-Dutemps L, Bourguet M. Procede plastique de dacryocystorhinostomie et ses resultats. An Ocul 1921;158:241-6. Caldwell GW. Two new operations for obstruction of the nasal duct. NY Med J 1893;57:581-2. Watkins LM, Janfaza P, Rubin PA. The evolution of endonasal dacryocystorhinostomy. Surv Ophthalmol 2003;48:73-84. McDonogh M, Meiring JH. Endoscopic transnasal dacryocystorhinostomy. J Laryngol Otol 1989;103:585-7. Wormald PJ. Powered endoscopic dacryocystorhinostomy. Laryngoscope 2002;112:69-72. Tsirbas A, Wormald PJ. Mechanical endonasal dacryocystorhinostomy with mucosal flaps. Br J Ophthalmol 2003;87:43-7. Bakri SJ, Carney AS, Downes RN, Jones NS. Endonasal laser-assisted dacryocystorhinostomy. Hosp Med 1998;59:210-5. Muellner K, Bodner E, Mannor GE, Wolf G, Hofmann T, Luxenberger W, et al. Endolacrimal laser assisted lacrimal surgery. Br J Ophthalmol 2000;84:16-8. Rizvi SA, Saquib M, Maheshwari R, Gupta Y, Iqbal Z, Maheshwari P, et al. Cosmetic evaluation of surgical scars after external dacryocystorhinostomy. Int J Ophthalmol 2016;9:1745-50. Vagefi MR, Winn BJ, Lin CC, Sires BS, LauKaitis SJ, Anderson RL, et al. Facial nerve injury during external dacryocystorhinostomy. Ophthalmology 2009;116:585-90. Dolman PJ. Comparison of external dacryocystorhinostomy with nonlaser endonasal dacryocystorhinostomy. Ophthalmology 2003;110:78-84. Ozer S, Ozer PA. Endoscopic vs. external dacryocystorhinostomy-comparison from the patients' aspect. Int J Ophthalmol 2014;7:689-96. Huang J, Malek J, Chin D, Snidvongs K, Wilcsek G, Tumuluri K, et al. Systematic review and meta-analysis on outcomes for endoscopic versus external dacryocystorhinostomy. Orbit 2014;33:81-90. Ben Simon GJ, Joseph J, Lee S, Schwarcz RM, McCann JD, Goldberg RA, et al. 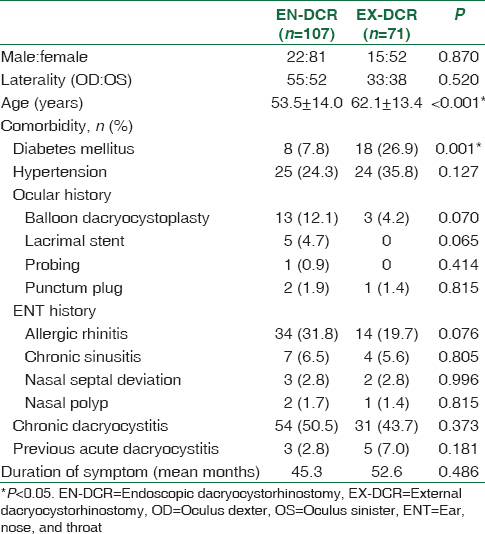 External versus endoscopic dacryocystorhinostomy for acquired nasolacrimal duct obstruction in a tertiary referral center. Ophthalmology 2005;112:1463-8. Lee DW, Chai CH, Loon SC. Primary external dacryocystorhinostomy versus primary endonasal dacryocystorhinostomy: A review. Clin Exp Ophthalmol 2010;38:418-26. Tarbet KJ, Custer PL. External dacryocystorhinostomy. Surgical success, patient satisfaction, and economic cost. Ophthalmology 1995;102:1065-70. Mekonnen W, Adamu Y. Outcome of external dacryocystorhinostomy in Ethiopian patients. Ethiop Med J 2009;47:221-6. Fayers T, Laverde T, Tay E, Olver JM. Lacrimal surgery success after external dacryocystorhinostomy: Functional and anatomical results using strict outcome criteria. Ophthal Plast Reconstr Surg 2009;25:472-5. Warren JF, Seiff SR, Kavanagh MC. Long-term results of external dacryocystorhinostomy. Ophthalmic Surg Lasers Imaging 2005;36:446-50. Barmettler A, Ehrlich JR, Lelli G Jr. Current preferences and reported success rates in dacryocystorhinostomy amongst ASOPRS members. Orbit 2013;32:20-6. Kwok T, Ali MJ, Yuen H. Preferred practice patterns in endoscopic dacryocystorhinostomy among oculoplastic surgeons in Asia-Pacific region. Orbit 2017;17:1-6. Gauba V. External versus endonasal dacryocystorhinostomy in a specialized lacrimal surgery center. Saudi J Ophthalmol 2014;28:36-9. Dave TV, Mohammed FA, Ali MJ, Naik MN. Etiologic analysis of 100 anatomically failed dacryocystorhinostomies. Clin Ophthalmol 2016;10:1419-22. Lin GC, Brook CD, Hatton MP, Metson R. Causes of dacryocystorhinostomy failure: External versus endoscopic approach. Am J Rhinol Allergy 2017;31:181-185.